This universal opener is designed to accommodate almost any jar in your kitchen. It's fully compatible with lids from one to four inches in diameter, so you can easily open soda bottles, medicine containers, pickle jars, or pasta sauce with the same effortless speed. A thick rubbery layer on the inside grips tightly to metal or plastic tops, and allows you to twist them off without slipping or sliding. The durable handle is made from a high quality plastic, and the long length provides increased leverage so you can apply the force necessary to open stubborn containers without straining. Four different openings will each adapt to a variety of lid sizes, and with no adjustment necessary, you will find it quick and simple to choose the one that fits. Simply grip and twist to make it work, and never worry about weak hands, or stuck tops. The wide grip is extremely comfortable to hold, and because your effort is multiplied, you will never have to struggle to access the contents of any container. 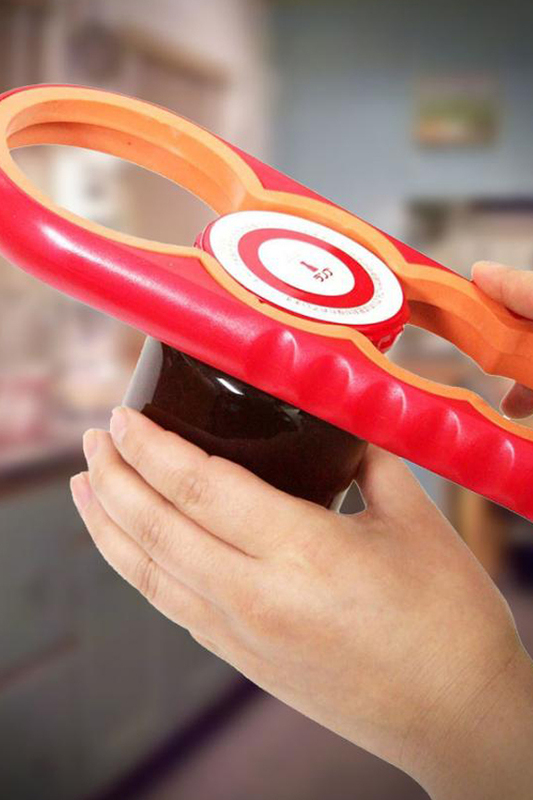 This tool makes a great addition to any kitchen, but it is particularly useful for elderly folks, children, people with arthritis, and anyone with a disability that would make this everyday task difficult. Compatibility Works with lids up to 4" in diameter. Uses Open jars the fast and easy way. Achieve a secure grip, and increase turning force to make any top twist off with ease. Adaptable Yes. Each opening flexes to work with a variety of lids. One of the easiest and most simple ways to remove any lid. This tool enhances your own ability and compensates for a weak grip, inadequate strength or any similar issue that is preventing you from opening jars. 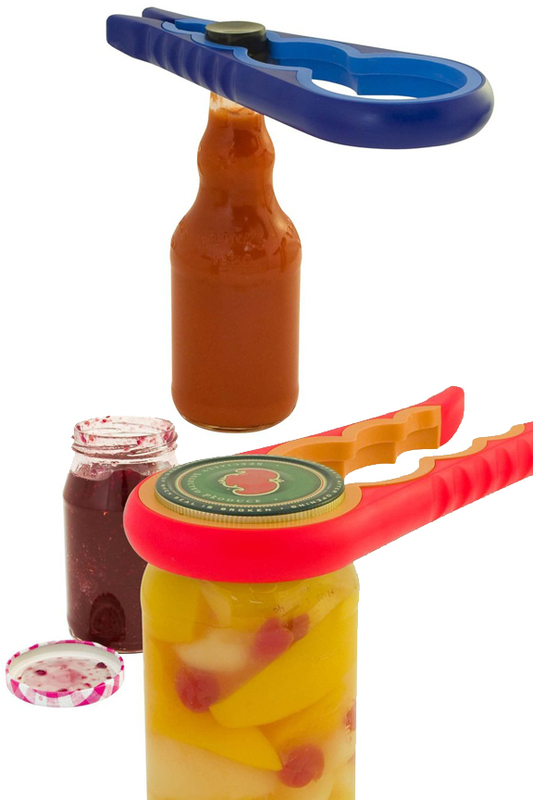 Simply grip and twist to take any lid off quickly and easily. Order Yours Today! Love this item. If you have arthritis in your hands this is a life saver. Works beautifully on many size jars and bottles. So happy I bought it and highly recommend. Works ok but color starting to come off. Also, we received a pink one and it would have been nice to be able to select a color. This was for use in a Chemistry Stockroom and pink would have not been my choice. Tried robot advertised on TV really inefficient and slow, broke in 2 weeks. This tool is simple and effective it works just as advertised. I have used "a easy twist off jar opener" longer than I can remember. And lots of friends have always wanted one, but I have no idea where I got it. So think how thrilled I was when I found it on your site. I immediately ordered multiple Christmas presents, emailed many friends about it, who wrote back just as thrill as me, placing orders. I am now 61 yrs with severe arthritis at the base of both thumbs, this is a dream. so much better than tapping the jar and getting a rubber something to grip it and hope the top will come off. Reading reviews; be realistic and think it through. if you put it on a cap that stretches the handle so wide you cannot get your hand around it, then it is obviously not going to work. I even ordered 2 extra for me, the old just in case, back up. Am a Sr Citizen, so this jar opener is an invaluable tool! Love it! Exactly what I wanted, at the lowest price and arrived quickly! 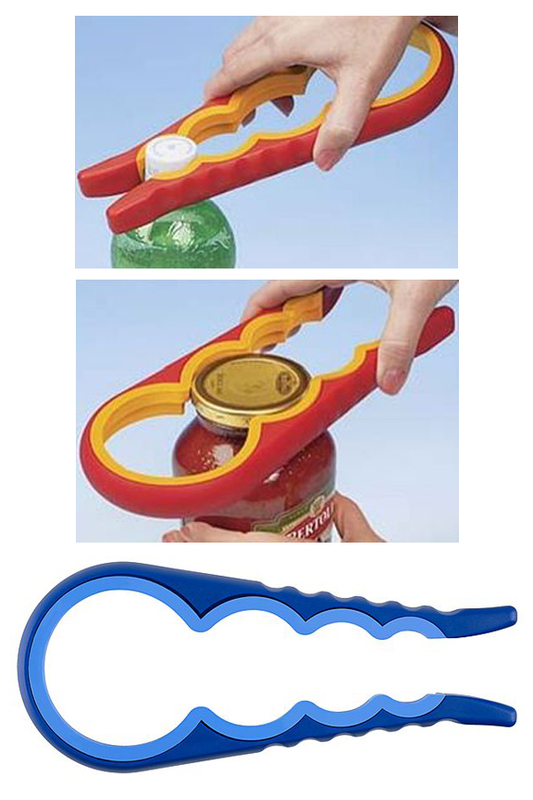 This item got the highest rating of any jar opener so I ordered it. It appeared to be a good quality item. The first jar I tried to open was a jar of green olives. My hands are small and my wrists are weak. It was very hard to hold the jar and try to open it. So, I put it on my counter top, but it slid around too much to open it. Also, I couldn't squeeze it hard enough to keep the opener from slipping on the jar lid, so it wouldn't grip it tight enough to open it. I just can't use it, it doesn't work for me at all. I received the Easy Twist opener and my life has changed for the better ... I have NO problem opening jars, bottle caps ... you name it this thing works. I hurt my right arm a few years back and lost the strength in my right hand. I am also a single woman and I don't have the advantage of extra hands to help me open things up. I can't thank you enough for this wonderful product! I bought this for my son-in-law who has weak wrists. He thinks that it is a great help for him. I would say a very good product.? 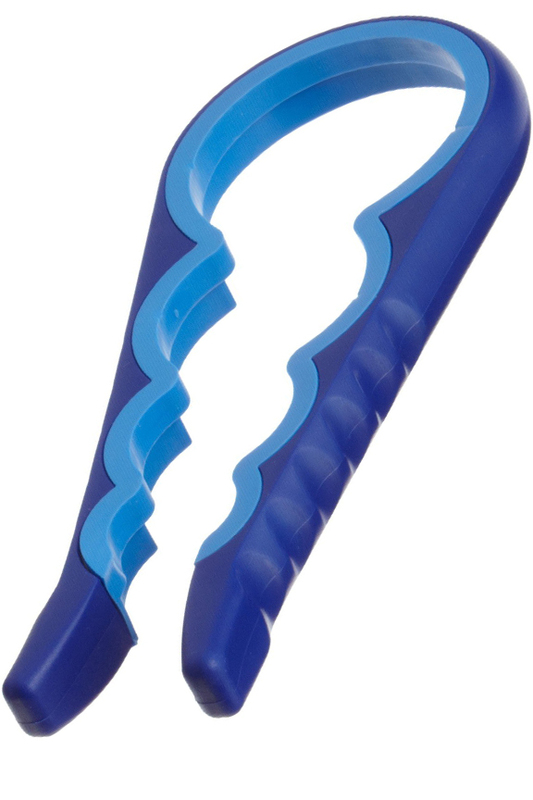 Does the East Twist Jar Opener (KI7208) come in both the displayed colors Blue AND ORANGE? I first enter the BLUE color and later go back and click on the red color. The order shows only two blue colors. What's available? At this time, color choice is random unless requested otherwise. We have blue and green in stock as of today. Call and order by phone, or use the comments box at checkout to ensure you get the color you want. 10 of 10 Customer(s) found this Answer helpful. The Ultimate Can Opener. Get 5 Tools in One! Remove Lids Safely. Reduce Mess. Increase Speed. The Fast and Easy Way To Open a Champagne Bottle. The Fast and Easy Way to Open Any Jar!